Get that kid some gelato, pronto. We ate well in Italy, and not by chance. I knew that ‘x’ amount of days meant ‘x’ amount of meals and desserts and because Italian is my favorite cuisine, I didn’t want to waste a single dining opportunity. I researched food blogs and forums, magazines and even guidebook reviews and compiled a list of recommendations. During the many months leading up to our trip, I developed great expectations for memorable culinary experiences. Too often in Rome, though, our sightseeing schedule didn’t jive with the good restaurants, which are often far removed from touristy areas. Florence, however, is a much smaller city and because we were staying in Oltrarno, an area known for delicious and reasonably priced restaurants, it turned out that every place we ate was a place to which I’d gladly return. We ate well throughout the city, though, including at the place pictured above, called Vestri, just a short walk from the Duomo. 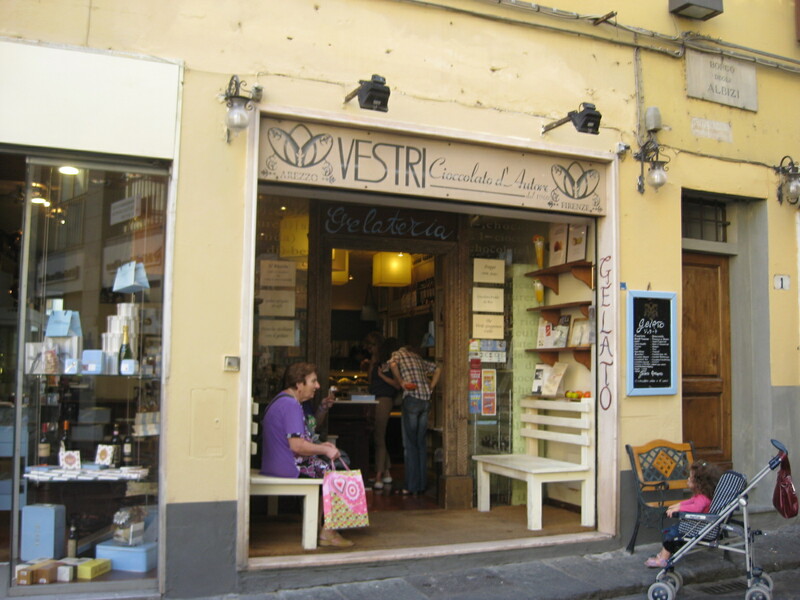 Vestri (Borfo degli Albizi, 11r) is a chocolatier that also happens to have excellent gelato. The dark chocolate flavor was excellent, of course, as were the hazelnut and stracciatella. Another notable gelato spot was Carapina (via Lambertesca, 18r), which is all about quality, seasonal ingredients. We popped into the small outpost near the ponte Vecchio for some sustenance after an afternoon at the Uffizi and, cups in hand, joined the small crowd of people enjoying their own cones and cups along the small, cobbled lane. Grom (via delle Oche, 24r), a chain, proved a good alternative to the puffed up bins of unnaturally colored and flavored gelato throughout the city center. The caramello al sale (salted caramel) was particularly tasty. I’m wild about French baguettes and the freshly pressed sandwiches that are common street food in Paris. I had imagined that Italy, being home to panini, would offer a similarly good rustic bread but until we visited ‘Ino, near the Uffizi, I had been surprised and bewildered by the inferiority of Italian bread. ‘Ino has a clean, modern design (tables are barrels topped with clear glass) and offers not only plenty of sandwich options, but functions as a tiny grocery as well–a great option for souvenirs of the edible sort. 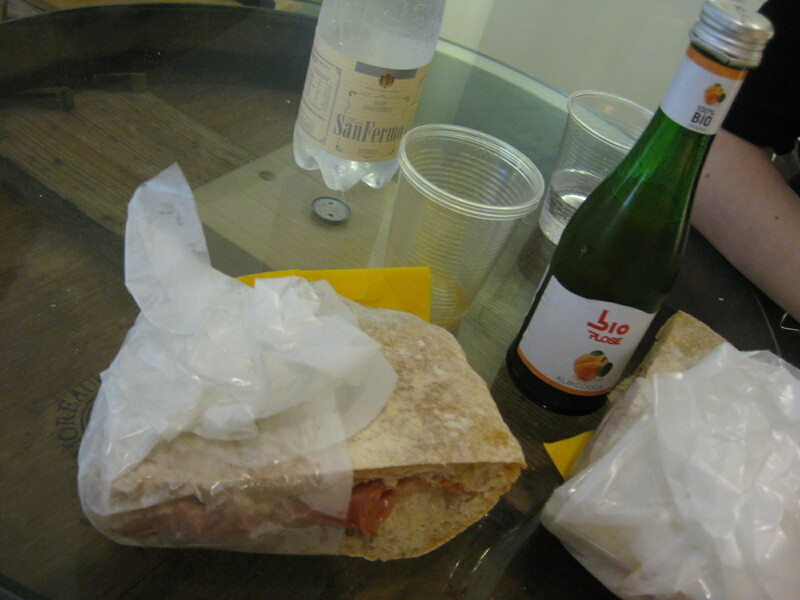 The freshly made loaf (pictured above) sandwiching a few slices of proscuitto tasted as good as it looks. How fresh and colorful can you get?! 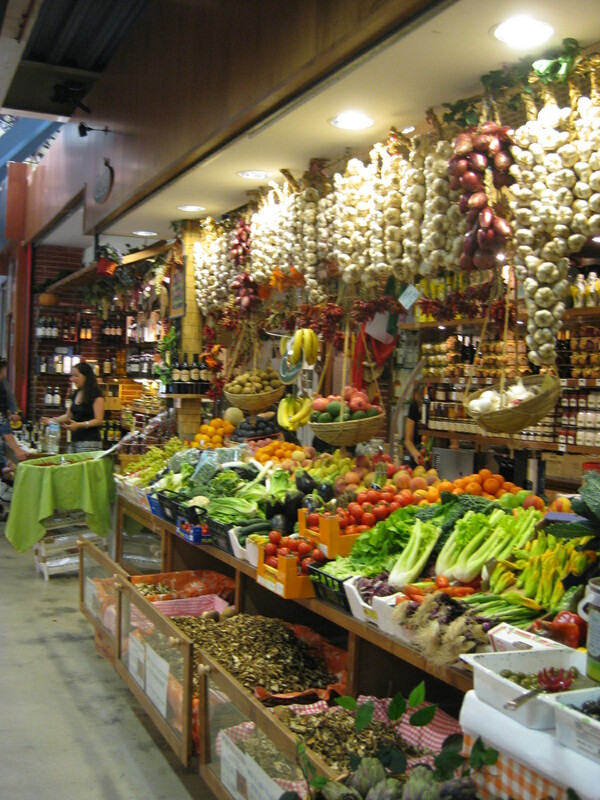 The San Lorenzo Mercato Centrale is, to use a well-worn but highly appropriate cliche, a feast for the eyes. As it turned out, that’s just what we did: our bellies still full from lunch, we walked all over the market, gawking at the fresh produce and browsing the sweet shops. You can have a sit down meal or grab a sandwich, fruit, cheese, wine, chocolates, and other picnic provisions from one of the many stalls. Note that the streets around the church of San Lorenzo leading towards the covered food market are filled with market stalls selling souvenir t-shirts, cheap clothes, and leather goods. This is the place to bargain for that ‘Ciao, Bella!’ t-shirt you’ve been eyeing. For more tips on markets, wine bars, and restaurants in Florence, check out this Florence for Foodies post from the Divina Cucina blog. Carapina and Vestri are featured in this post on doing a Florence ‘gelato crawl’, by Faith Willinger.